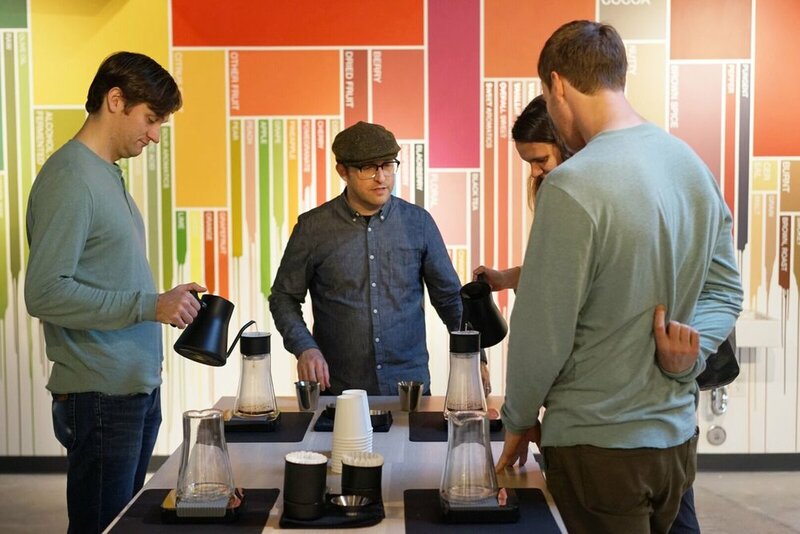 Creators of the Stagg Pour Over family of kettles and dripper and other great coffee and tea brewing equipment, Fellow Products launched out of a little mixed use space in San Francisco in May 2015 when their Kickstarter for the Duo Coffee Steeper raised $193,402 out of their $50,000 goal. "After months of picking French press grinds out of his teeth, our founder, Jake, wanted something better. Jake comes from Caribou Coffee and is an avid home brewer. He kept moving back and forth between the French press and pour over. Both can make a great cup of coffee, but have their respective drawbacks. After 8 months and countless prototypes with our friends at Enlisted Design, Duo – a dual chamber “twist” on a traditional French press – was born." Their desire to combine quality brewing with beautiful product design led to a line of coffee and tea equipment we’re proud to support and use in the shop. In so many fields, consumers have to choose between devices that are functionally advanced or devices that are aesthetically pleasing but lacking in functionality. Fellow’s line of products gives equal weight to design and craft allowing for products that use the best innovations in brewing while hiding those innovations in design to create products that consumers actually enjoy using. Great pour overs hinge on control. With the Stagg Kettle, Fellow places all the power in your hand by shifting the balance of the kettle closer to your hand for easier pouring, a flow-restrictor in the spout for a slower and more optimal pour and a thermometer built into the lid of the kettle so you don’t have to worry about your thermometer falling out of the steam vent. With the addition of the EKG Fellow’s Stagg lineup, you can get all of the best things about the Stagg Kettle while adding temperature variability and control. The EKG+ adds bluetooth connectivity for brew tracking and pairing to Acaia Scales and their family of apps. Fellow continually looks to improve the home brewing experience. Some of their latest releases include the Prismo, an Aeropress attachment for brewing espresso, the Stagg Pour Over Dripper, and the Stagg EKG+. For the dedicated tea drinker, The Raven Tea Kettle takes all of Fellow’s best ideas and applies them to tea. Some of these items are available in the shop or on our online store. The rest are available on Fellow's website. Next week, we'll talk more in depth about the Stagg [XF] Dripper and why we think it's amazing.